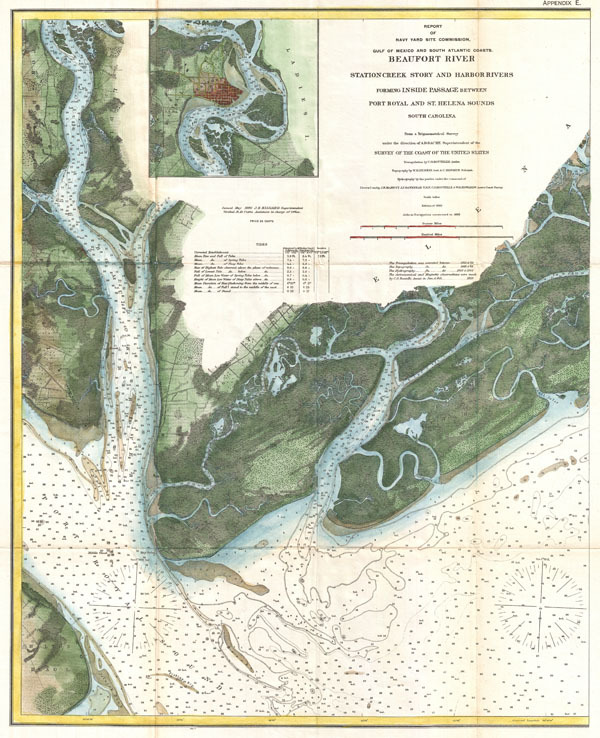 A beautiful example of the 1882 U.S. Coast Survey chart or map of the Beaufort River, South Carolina. Covers from Port Royal Island to Hilton Head and east as far as Skill Inlet on Pritchard Island. Offers stunning inland detail as well as thousands of depth sounding. An inset of Beaufort, considered one of the most beautiful towns in South Carolina, appears in the upper left quadrant. The triangulation for this chart was completed by C. G. Boutelle. The topography is the work of W. H. Dennis and C. Hosmer. The Hydrography was completed by a party under the command of J. N. Maffit, J.F. Bankhead, C. O. Boutelle and W. S. Edwards. The original chart, which appeared in 1864, was produced under A. D. Bache, superintendent of the Survey. This edition has been updated to 1882 under the supervision of J.K Hilgard and J. D. Cutts. Very good condition. Original fold lines.